Building stuff out of cubes is apparently more dangerous than you might expect. That tribute to your favorite TV show or videogame that you lovingly crafted out of blocks of stone in MineCraft could land you in some legal hot water if the company that made the original is in a litigious mood. Using the full-sized replica of the Enterprise-D from Star Trek: The Next Generation constructed by Hal "Halkun" Nicholas as an example, Public Knowledge reports that under US copyright law, that replica could be considered a "derivative work" and leave Nicholas open to a lawsuit from Viacom, the studio that owns the rights to Star Trek. What's more, if such a work was created on a public server, the server owner could also be sued for secondary infringement. You might make the argument that there's no commercial gain involved in your mile-high replica of Mario's head, or whatever else you might have built, but that's not a guaranteed defense, and would require actual legal counsel to see if it's applicable. But before you go tearing down the fortress you built in the shape of Sonic's left sneaker, be aware that this is just something that could happen, not something that definitely will happen. 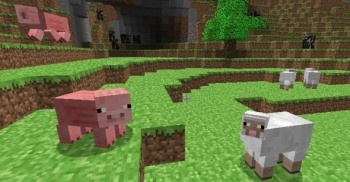 With the vast number of derived works based on videogames, TV shows and movies, it seems incredibly unlikely that studios, developers and publishers would single out MineCraft players for a legal smackdown. You might receive a cease and desist letter, but even that seems like a lot of effort to go to for something so trivial.